Local commercial banks may be headed towards tough times as their overall liquidity position has been shrinking for over three months in 2018, standing at only N$1,1 billion in December. This is roughly half the liquidity position recorded in November 2018, which stood at N$2,3 billion. 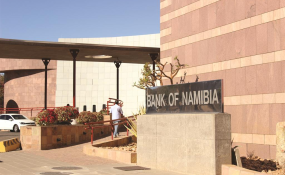 The Bank of Namibia (BoN)'s money and banking statistics recent report revealed that the cash reserves of commercial banks have decreased from October 2018 throughout December 2018. Statistics indicate that the commercial banks' overall liquidity was N$4,7 billion in September 2018, but then declined to N$3,4 billion in October 2018. The figure declined further to N$2,3 billion in November 2018, and then to N$1,1 billion in December 2018. According to the report, the decline in the overall liquidity position of commercial banks was mainly triggered by foreign currency outflows to trade-related payments. In response to questions from The Namibian, the central bank's deputy director for corporate communications, Kazembire Zemburuka, said commercial banks with squeezed liquidity positions might experience difficulty in meeting their day-to-day funding obligations. He said because banks are required to pay for imported goods and services on behalf of their clients, their cash balances will decline. Customers, on the other hand, will be hindered from having the ability to have immediate access to their deposits placed with these commercial banks. However, it is important to note that the reported decline in banks' liquidity position is not alarmingly low, and that the BoN has standing facilities which provide collateralised funds to commercial banks when the need arises. Zemburuka added that high liquidity positions would enable commercial banks to extend credit, which may have a positive impact on the economy, provided that such loans are used productively. Loans granted for the establishment of new businesses or the expansion of existing businesses are productive loans, the deputy director added. The expansions or establishment of new businesses, may, in turn, lead to the creation of new job opportunities, and contribute to economic output. "Low liquidity positions, on the other hand, will limit commercial banks' ability to create loans, amongst other things. This means that businesses seeking to raise funds for growth purposes may not be able to do so, impacting negatively on the economy," Zemburuka said. Standard Bank said in response that a bank's liquidity position is quite confidential, and they are thus not able to comment further on the matter. Head of funding and liquidity management at Bank Windhoek, Diederik Kruger, said when banks have more deposits than loans, it is called surplus liquidity. According to him, surplus liquidity is essential for banks as it helps them manage liquidity and ensures that deposits which mature can be repaid, while new loans can also be extended at any given point. "Currently, banks in Namibia have surplus investments in liquid assets and hold smaller balances in cash with the Bank of Namibia, thereby reducing the surplus position of the overall market," Kruger said. He added that this means banks are expected to wait for instruments to mature and enter into a repo market to exchange instruments for cash in order to get the liquidity needed for lending operations. Kruger confirmed that a decrease in liquidity could also be due to outflows of investment capital to other markets, especially South Africa. He added that when South Africa's interest rates trade above Namibian rates, then more investment flows will go to investments in South Africa, and this will reduce liquidity in the local market. This will result in higher deposit rates from the banks to attract deposits from South Africa back into the local market. Higher deposit rates will, in turn, lead to higher lending rates, and may result in a higher bank rate from the Bank of Namibia. "Low liquidity, in short, will lead to higher deposit rates and higher lending rates that will affect clients," Kruger stated. A local analyst, who preferred to remain anonymous, said a bank's liquidity position is determined by the bank's ability to meet all its anticipated expenses, such as funding loans or making payments on debt, using only liquid assets. "Ideally, a bank should maintain a level of liquidity that also allows it to meet any unexpected expenses without having to liquidate other assets," she added. The analyst further said banks must meet funding needs for their operations, must be able to repay their debts, and must have enough cash on hand to meet withdrawal requests from their clients and fund new loans for customers. "A lack of liquidity is the fastest path to failure for a bank," the analyst observed.